How much trivia do you know about our favorite family of birds? Head on over to Buzzfeed where I’ve created a quiz to test your knowledge. 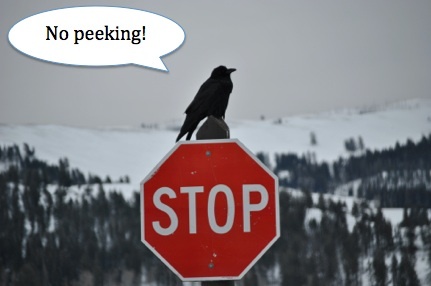 When you’re done, feel free to come back to this page and scroll past the corvid photos for more information, citations/links, and to post your score in the comments section. Can anyone get 100%??? 1. Were you surprised to learn that they are songbirds? Indeed, corvids have impressive vocal repertoires and are among the minority of songbirds that can learn new sounds throughout their lives1. 2. I’ve railed (get it?!) about this in a previous post but until this image stops circulating my Facebook feed I’ll take every opportunity show folks what real baby crows look like. 3. The life span of different crow species (Fish, American, Hawaiian and Northwestern) is similar and generally they top out at between 14-24 years. Ravens on the other hand, usually only make it to 13, though in captivity they can live 40-80 years1. 4. It’s a common misconception that humans can get WNV from touching a crow, but there’s no evidence for it according to the CDC. It’s an understandable rumor, however, considering that corvids are an ideal host for this virus, something I’ve talk about in a previous post. Humans on the other hand, are considered dead-end hosts, meaning the virus can’t proliferate in our bodies (though that doesn’t preclude it from making some of us very sick). The real transmission culprits are mosquitoes. 5. Learn more about the ‘Alala at American Bird Conservancy. 6. Currently there are actually 7, not 6, ravens at the Tower (you know how those Brits are about their spares!). According to Historic Royal Palaces they eat 170 g of raw meat a day, plus bird biscuits soaked in blood. Yum! 7. 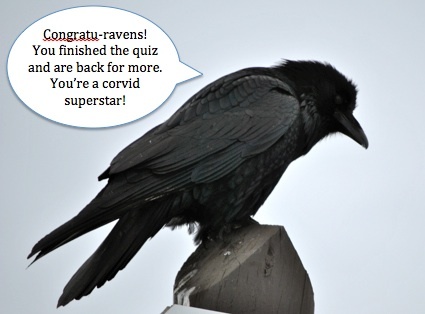 Originally, I was going to make the whole quiz just a corvid ID quiz, but I decided that might get old quickly. Still wanted to get at least one question in there! 8. Again, ‘murder’ and ‘unkindness’ are not words you’ll typically see in scientific writing (apart from, perhaps, as a means to a pithy article title). But they make good trivia questions nonetheless. Fun fact: Company is the term for parrots and deceit is for lapwings. 9. John Marzluff discusses nearly all these behaviors in his books, so I’ll make thing easy and simply refer you to In the Company of Crows and Ravens. 10. New Caledonian crows are well know for their puzzle solving prowess, but I’m sure ‘007’ completing this task had his researchers especially delighted. To see footage of 007 at work check out this video. 11. Keeping crows, like hunting them, is regulated under both federal and state laws. 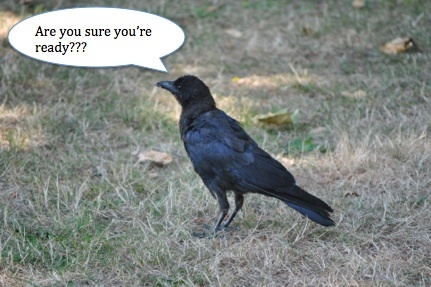 To learn more about the rules regulating crows read my previous post on the Portland crow poisoning. 12. I recently acquired Crows and Jays by Madge and Burn, and recommend it to anyone who wants to become more familiar with all 120 species. 14. Part of why I wanted to create a trivia quiz is because I thought it would be a fun excuse to go hunting for a thing or two I didn’t know myself. Jimmy’s story was exactly the kind of discovery I was hoping for. Perhaps I’ll do a bit more digging and dedicate a whole post to it. 15. It’s with good reason that John’s motto about crows is that “they’re little flying monkeys”. I love this study2 and sharing its findings never gets old! This kind of equity perception is something that’s been rarely documented outside of primates and underscores the impressive convergent evolve that’s occurred between corvids and primates. Hmmm, a very disappointing 8/15 – I may have to return my professorship…..
12/15, I’m a proud corvid fan. Great articles and photos, thanks! I’m such a nerd- got 14/15. I do adore the corvids!